For a few months last year I was working on the UWS, and after so many years of working here in Brooklyn the biggest challenge was finding new places to eat lunch. There are a lot of mediocre restaurants around, and very few cheap ones. I had eaten a couple of meals at Hummus Kitchen, a mini-chain which was pretty good but more upscale than I usually like my falafel places. On one of my last days working in the neighborhood I came across a place named Ali Baba, and as soon as I walked in I knew I was going to like the place. Ali Baba is an Israeli-run falafel joint, with only one table (with about eight chairs) and a bunch of freshly made salads lining the counter. I got the falafel platter, which included some of the best falafel I’ve eaten outside of Israel itself — full of herbs and spices, not merely fried chickpeas. The salads were fantastic, and tasted homemade. There was a spicy cooked onion and tomato salad, slices of fried eggplant, sweet and sour cooked carrots, a salad of raw tomatoes and cucumbers, hummus, and pickles. 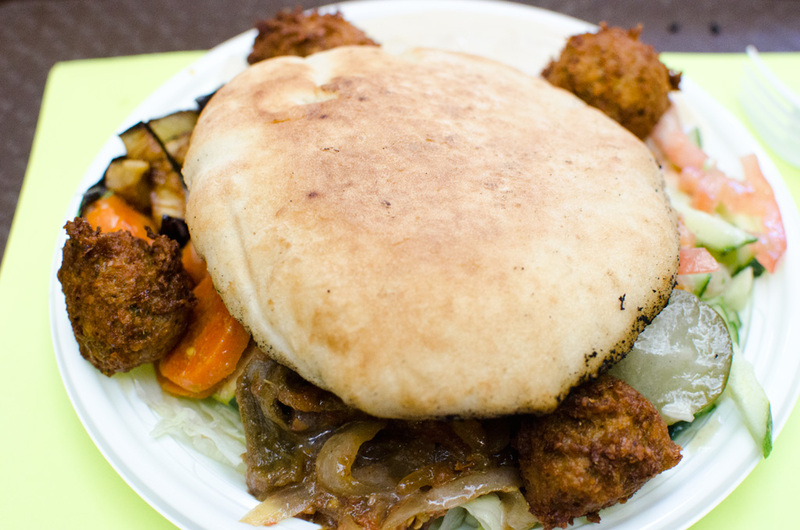 Pickles are my favorite falafel topping, by the way, and one that is often overlooked. Over the next week or so that I worked in the area, I would pass by and see the restaurant closed at odd hours; not just during Shabbat, but at random times as well, so if you’re in the neighborhood and hungry, it’s worth passing by to see if they are open — but make sure you have a backup plan, just in case.